Click on a feature to learn more. Tap on a feature to learn more. The Resource Guide is the most powerful feature in the Olive Tree Bible App. As you read your Bible in the main window, the Resource Guide follows along and displays relevant Bible study information from your study notes, commentaries, maps and more. Gain knowledge on any passage of the Bible, exactly when you need it. The Resource Guide will let you know when information in this title is relevant to anything in the main window. It will also track along with you as you read through the Bible. Quickly find information about a book of the Bible, its author, date, audience, purpose, and other topics. If you have an introduction to the book of the Bible you're currently reading, the Resource Guide will make it easily accessible for you. Did your resource mention a passage of Scripture, but you can't remember what the verse says? Never fear! Tap the linked verse and a pop-up window will appear, giving you quick and easy access to the verse in context. iPad, iPhone, Android, Kindle Fire, Mac, and Windows. No one familiar with the Bible needs to be told that it is a truly remarkable work. But it takes help to understand this ancient collection of diverse forms of literature written by different people across many centuries. The Eerdmans Commentary on the Bible (ECB) is among the finest single-volume Bible handbooks now available. Written by world-class Bible scholars, the ECB encapsulates in nontechnical language the best of modern scholarship on the sixty-six biblical books plus the Apocrypha. 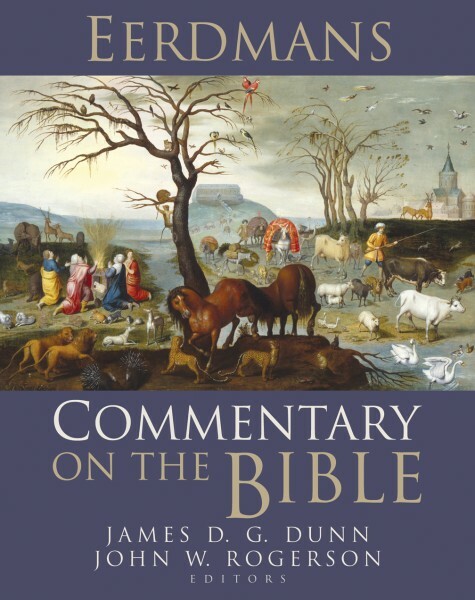 This one-volume Bible commentary covers all the texts regarded by one or more Christian churches as canonical, and provides reader-friendly treatments and succinct summaries of each section of the text that will be valuable to scholars, students and general readers alike. The primary objective of this work is to clarify the meaning of each section of the Bible. Rather than attempting a verse-by-verse analysis (virtually impossible in a one-volume work), the ECB focuses on principal units of meaning -- narrative, parable, prophetic oracle, section of argument, and so on -- highlighting their interconnectedness with the rest of the biblical text. The volume also addresses and answers major issues -- including the range of possible interpretations -- and refers readers to the best fuller discussions. Beyond providing reliable, informative commentary, this hefty volume also includes thirteen introductory and context-setting articles that do justice to the biblical documents both as historical sources and as scriptures. The sixty-seven contributors to the ECB come from a wide variety of backgrounds and are acknowledged leaders in the field of biblical studies. Their contributions stand out either for their fresh interpretations of the evidence, or for their way of asking new questions of the text, or for their new angles of approach. While the translation of choice is the New Revised Standard Version, many of the contributors offer their own vivid translations of the original Hebrew or Greek. Cutting-edge, comprehensive, and ecumenical, the ECB is both a fitting climax to the rich body of interconfessional work undertaken in the latter part of the twentieth century and a worthy launching pad for biblical study in the twenty-first. Need to set up an account? Create Account. New! Learn how to earn points when you buy. Copyright ©1998-2019 Olive Tree Bible Software.